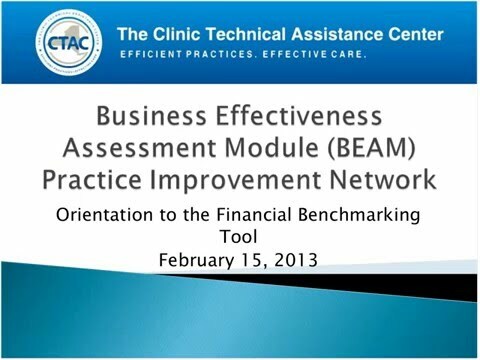 CTAC’s “BEAM Module 2: Orientation to the Financial Benchmarking Tool” introduces an Excel-based Financial Benchmarking tool. The focus of the training is on how clinic management can use the Quick Analysis Tab within the Excel tool to play with different scenarios without requiring specific data from their billing, finance, or HR departments. Using the Quick Analysis Tab, clinics are able to switch variables (payer mix, billable hours, operating costs, etc) and see in real time how their clinic's bottom line is affected. The Quick Analysis Tab allows clinics to calculate with a click of a mouse what different scenarios or service mixes work best for their clinic structure. They are also able to see what factors generated by the Quick Analysis Tab either increases or decreases their bottom line. Future trainings will support clinic leadership in eventually being able to understand and complete the entire Financial Benchmarking tool; however this training narrowed in on how clinic management can use the Excel Financial Benchmarking Tool immediately for practical applications.